The best artists are driven by their nostalgia for the greats who came before them. They are then able to turn their longing for the past into an appreciation of the present. This is what Woody Allen wants us to take away from his latest film, Midnight in Paris. Midnight in Paris stars Owen Wilson as Gil Pender, a Los Angeles-based screenwriter on a Parisian vacation with his image-concerned fiancée, Inez (Rachel McAdams). Gil, like any other artist, is fascinated by the cultural history of Paris and he romanticizes living in some Parisian attic as a expatriate writer. But Inez has other ideas. For her, Paris is great to visit while wearing ill-fitting shirt dresses, but nothing else. This difference drives a wedge between their relationship (though it is hard to see how they ever got together in the first place). Also on their trip are Inez’s equally image-concerned parents (yes, buy the really ugly expensive chairs that you can only find in Paris) who trust Gil about as far as they can throw him. By chance, Inez and Gil encounter friends, Paul (Michael Sheen) and Carol (Nina Arianda) in the French capital. The couples go site seeing with each other and Paul’s pretentiousness further alienates Gil from Inez. When Gil wallows in his frustrations while taking a walk at midnight, he is transported into the fantasy world of 1920s Paris. He meets literary greats and artists like Fitzgrald, Hemingway, Picasso, Stein, and Dali who help him with his novel about, what else, a man who works in a nostalgia shop. Gil also finds a muse in the gorgeous Adriana (Marion Cotillard), a woman who toys the affections of all the greats and sparks Gil’s romantic side. His wondrous encounters with Adriana and the other Lost Generation personas inspire Gil to take control over the direction of his life. Allen makes no secret that Midnight in Paris is drive in by a love for a great city’s history. The beautiful opening shots of Parisian landmarks, set to Sidney Bechet’s “Si to va ma mere“, introduces an American audience to a highly romanticized view of Paris. The first scene of Gil and Inez in Monet’s garden at Giverny looks just like a painting. Gil, discussing his love of Paris and Inez, looks like he is a part of this painting while Inez never quite fits. Their differences are painfully obvious right from the beginning. As the infamous personas – Cole Porter, Josephine Baker, TS Elliot – appear on the screen, the nostalgia for the past only swells. The actors – Adrien Brody as Salvador Dalí, Kathy Bates as Gertrude Stein, Corey Stoll as Ernest Hemingway – seem to be having great time in these roles. There is also plenty humor to be taken from the presence of these characters and with Gil acting as the audience, staring at them with amazement . In one scene, Gil tries to explain his problem of being from the future visiting the past to Dali and Luis Bunuel (Adrien de Van), until he realizes that he won’t get far because they are surrealists. 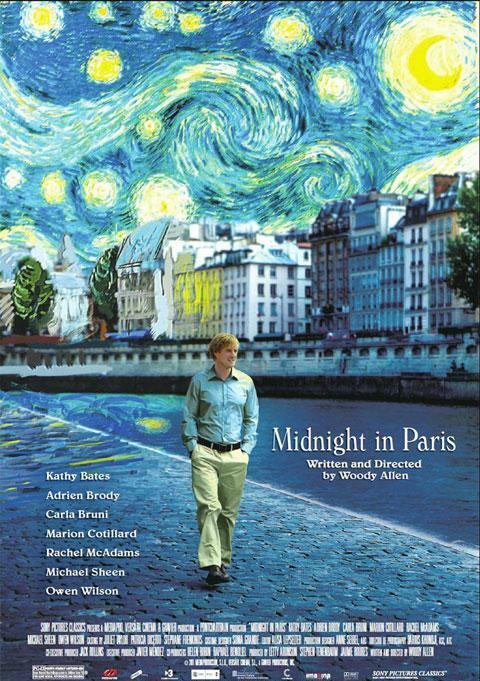 Midnight in Paris has become one of Woody Allen’s most successful films in 25 years already earning more than $23.3 million and it is a greater critical success than Allen’s previous two efforts. Allen continues his tour of great European cities with his next film The Bop Decameron, a romantic comedy set in Rome. Does any of that really matter though? Part of the fun of anticipating any Woody Allen is analyzing the few facts we know before seeing the final product and knowing we’ll watch it as long as Allen has made it. I really enjoyed the film as well. One of the best this year (thus far). If a person walks into this film without knowing anything about the artists that Gil encounters I would think they’d be lost. Not a knock on the film but an observation. I initially thought it was kind of fluffy and really just a loving postcard to Paris. But after thinking about it for a few weeks, the film has grown in my mind. As Robert Altman once said and I’m paraphrasing, you see a movie once to get the lay of the land and then see it a second time to really understand what a director was trying to say. I think I have to see Midnight in Paris again. I am with you on both points. Knowing who the historical characters are absolutely adds to the sense of nostalgia and mystique about Paris that Gil feels. A scene that stands out is when Gil was planting the plot of The Exterminating Angel in Luis Bunuel’s head. I got a good laugh out of that exchange but I was the only person in the theater who seemed to get the reference (or I was just the only person obnoxiously laughing out loud). I also plan on giving Midnight in Paris another look later in the year. Thanks for commenting!